Cradled among undulating vineyards and olive groves, this exquisite villa in Chianti Classico is pure decadence. Originally a 16thC farmhouse, the estate has been lovingly restored with the added grandeur of a Cypress-lined infinity pool and a vine-covered terrace from which views defy description. Gather the group for a round of Bocce on a designated court or fire up the barbeque in the courtyard redolent of lemon trees. Experience Tuscany as seen in the movies: stroll to the Medieval Vetrine Castle, savour the bold flavours of the local wine (and perhaps take part in its creation by stomping some grapes) and get lost in the winding streets of nearby Gaiole—one of the region’s most fairy-tale-like towns—all within walking distance of the estate. Perched on a hillside but still within walking distance of weekend markets and iconic castles, La Veduta di Vertine is the ideal location to relax and engage with family or friends. Attentive service and the natural splendor of the region make it a truly memorable spot. This villa is sold as part of part of a private B&R itinerary. Favourite Feature The infinity pool is a definite highlight. A post-dinner dip with a glass of Chianti overlooking the Tuscan hills is the perfect end to your day. This was the best holiday we have ever experienced. Everyone involved was outstanding in their care, humor, communication, and attention to details. Your trip will likely begin in Florence. Most transatlantic flights to Italy fly into either Milan or Rome, and Florence is readily accessible from either city. From Florence your drive to La Veduta di Vertine is less than an hour. From Siena your drive to La Veduta di Vertine is only a half hour. There are daily flights from Rome or Milan to Florence’s Peretola Airport. Peretola is about 20 minutes from the centre of town (and the train station) by taxi. You may also fly into Pisa and take a train to Florence, which takes about an hour. You would get from the Pisa airport to the train station using the high-speed PisaMover. Then, board the train to Florence (combined tickets for both the PisaMover and train to Florence are available at the airport Arrivals hall). No true estate-stay would be complete without the pleasure of fresh eggs in the morning, an organic garden with a bounty of produce or a kitchen stocked with the finest olive-oil (cold-pressed from green and black olives) produced just outside…The virtues of living off the land become quite apparent here. With five suites, each with a luxurious ensuite, the Villa comfortably sleeps up to 10 people. 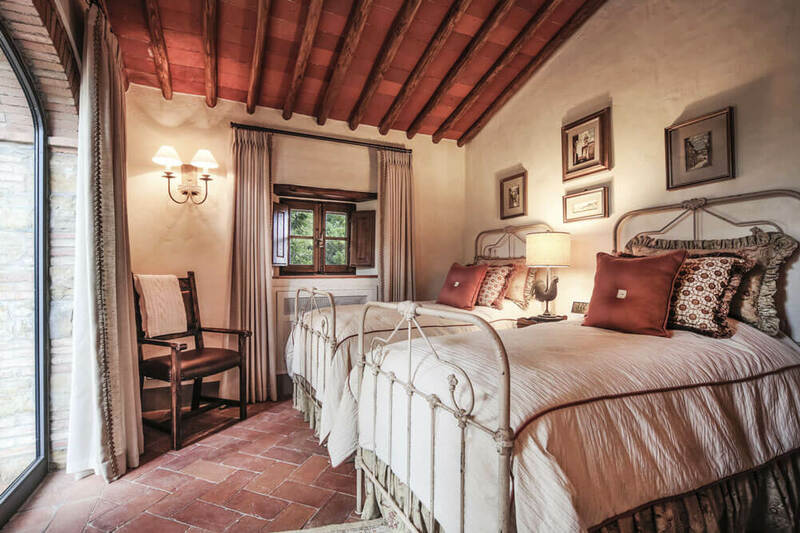 Each suite is framed by exposed beams and revels in the earthy tones of the red brick arches. In the main living area a huge fireplace anchors the room, only to be out-done by the large window that enables the famous Tuscan sun. 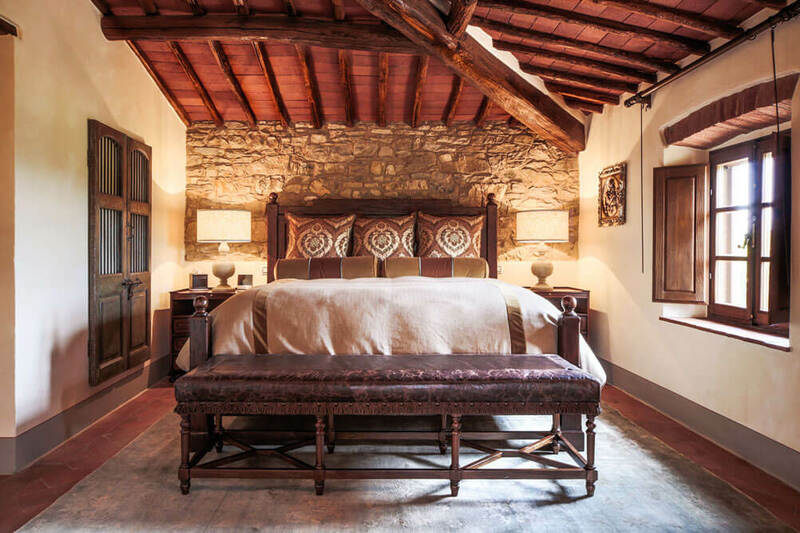 Villa Laura is an airy hillside Cortona estate known as the life-changing home of Diane Lane in the movie Under the Tuscan Sun… its beautifully restored 17thC walls now house this incredible 5-star luxury retreat. Welcome to your 17thC mansion with perfectly groomed gardens, touted amongst the best in Italy. Built in three tiers on the slope of a hill, Villa Origo is a dreamy homestead with hilltop views as far as the eyes can see. It's bursting with old-world charm, showcasing gorgeous antique furniture and a beautiful library. Discover a few ways to weave La Veduta di Vertine into an even grander journey.